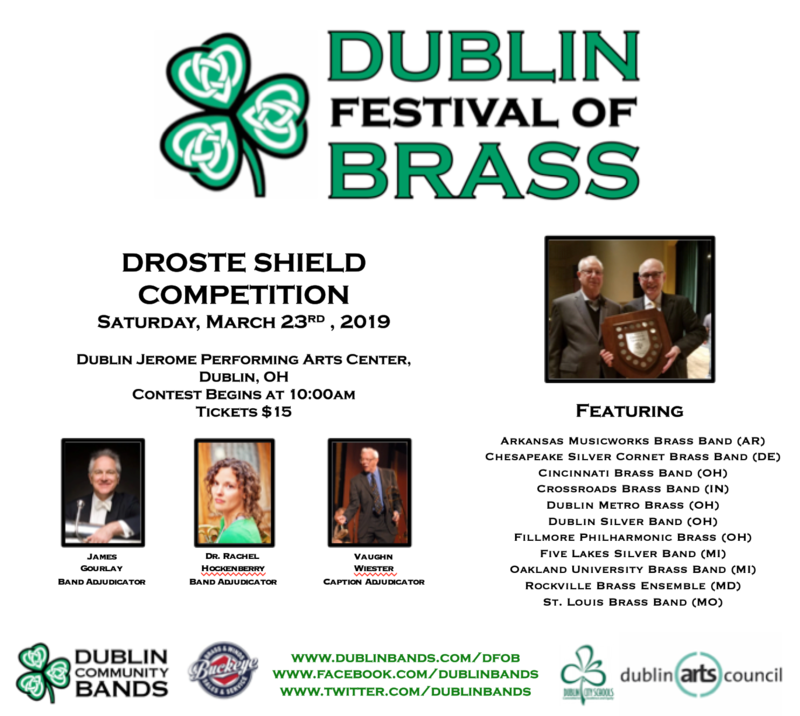 Saturday, March 23, please join the Cincinnati Brass Band along with 10 additional groups for a full day of music and excitement at the Dublin Festival of Brass! The Cincinnati Brass Band is excited to perform a combined concert with the CCM Preparatory Dept. Brass Choir. The CCM Preparatory Dept. Brass Choir, under the direction of Paul Hillner, is open to outstanding high school brass performers, the choir presents two concerts annually on campus and also performs in the community. Striving to fulfill our groups mission supporting performance, education and advocacy, the Cincinnati Brass Band will be holding a free-will offering and/or welcomes the donation of a used instrument to the Buddy Roger’s Music Lonely Instruments for Needy Kids (LINKS) program. The Buddy Roger’s Music LINKS program which puts musical instruments into the hands of needy students. The LINKS program brings together the desire of young students who want to learn to play an instrument with used instruments that others have no current use for. Through LINKS, you can donate your used instrument to a promising young musician who cannot afford to rent or purchase one of their own. The program began as a project of the College-Conservatory of Music Alumni Board in partnership with Buddy Roger’s Music. It started as an idea to fulfill a need that had been identified in the music programs of area schools. A Buddy Roger’s Music representative will be there to accept them and give you paperwork for your records. To learn more please visit the Buddy Roger’s Music LINK Program. Please e-mail paul.hillner@uc.edu for information about how your high school brass performers may audition for the group. Free parking is available in the church parking lot. The CBB is a member of the Association of Concert Bands, whose mission is to foster excellence in Concert Band music through performance, education, and advocacy.